Adrienne McDowell holds a master’s degree in teaching from JSU. McDowell was recently named 2019 JPS Teacher of the Year. 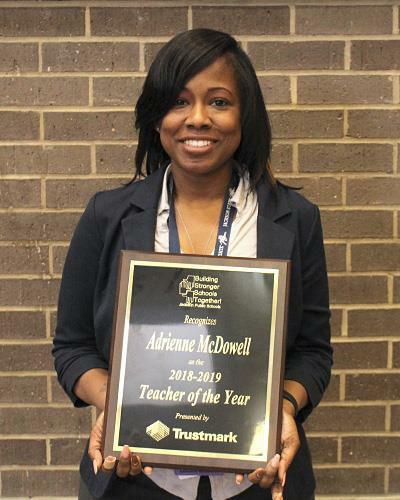 According to a release on the Jackson Public Schools’ website, Adrienne McDowell, an alumna of Jackson State University, was named 2018-2019 JPS Teacher of the Year. Dr. Errick L. Greene, JPS superintendent, led a contingent of well-wishers to Forest Hill High School where the English teacher learned of her award. Participating in the surprise announcement on January 18 were her principal Torrey Hampton, her colleagues, family and supporters of the school, and the local media. Even McDowell’s father and sister were there to celebrate. McDowell, who holds a Master of Arts in teaching from JSU, has been a teacher in JPS since 2008. Throughout her 11-year teaching career, McDowell has worked to ensure that all the scholars she teaches receives a quality education that will benefit them not only in the classroom but also in whatever educational or professional path they will embark on in the future. Her focus on high expectations and quality teaching and learning led to notable improvements in the growth of her students who were previously performing in the bottom 25 percent. Those scholars moved from minimal to passing on 2017-2018 English state tests. This school year, her scholars are achieving at the highest performance levels on subject area tests. Quality teaching and learning in her class means she monitors students’ understanding and adjusts her teaching methods. For instance, she turned a character study lesson into a mock trial. In their presentations, students had to become familiar enough with the text to effectively defend their positions in a mock proceeding.